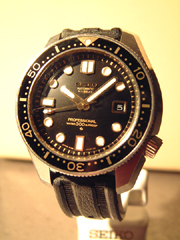 The professional diver's watch of 300m specification which used the first high beat highly efficient movement in Japan. The highest-class mechanical caliber of 10 beats as the highest oscillation mechanical movement in the world. There were 3 new casing technologies such as one-piece case structure, and rotating-rocking structure of glass fixing structure, and W-type screw down crown.